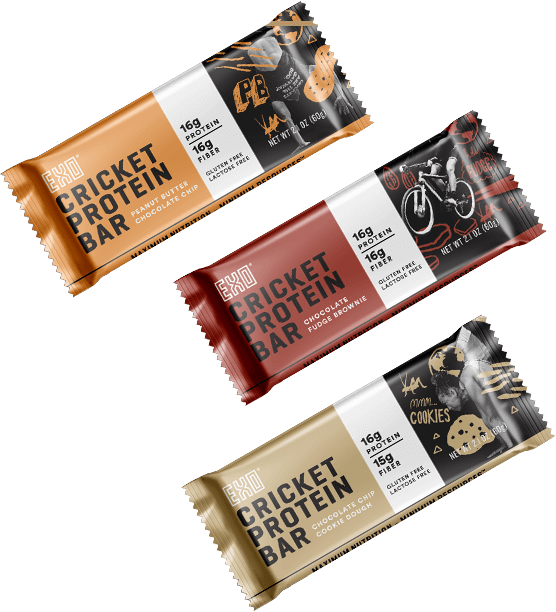 We believe crickets are the next great protein. The United Nations estimates that crickets are 20x more resource-efficient than cows when raised as a source of protein. They emit fewer greenhouse gases, use less water, and require less space and food. Even skeptics have to agree that crickets offer a sustainable solution to the real problem of feeding the world’s increasing population. Exo Protein dedicates itself to providing food that combines great taste with healthy ingredients. We ensure that every ingredient on our labels is something you recognize. We pride ourselves in leaving out syrups, stabilizers, and fillers. Every time you take a bite from an Exo protein bar or snack, be assured you are eating real food. Our snacks have some serious food world street cred, created by a team of chefs that have worked in numerous Michelin star restaurants. We mean it when we say that taste is a priority with our snacks. The crickets provide a slightly nutty flavor that pairs well with the fruits and natural sweeteners we use to make our bites and bars. Don’t take our word for it! We have over 6,000+ five star reviews. Our customers agree that our cricket protein based snacks are eco-friendly, healthy, and delicious. Join our growing group of satisfied customers by ordering your own variety pack or protein bites today!